This is a short account of a visit to Middlesbrough in 2011 divided over the eighteen images, replacing the usual individual image captions. 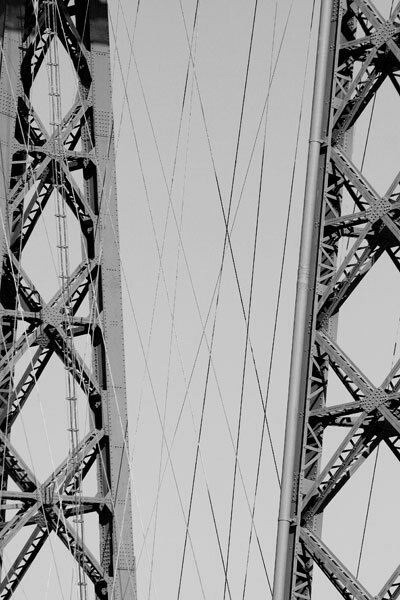 It has to be read right through to make sense and to reach information about the bridge itself towards the end. 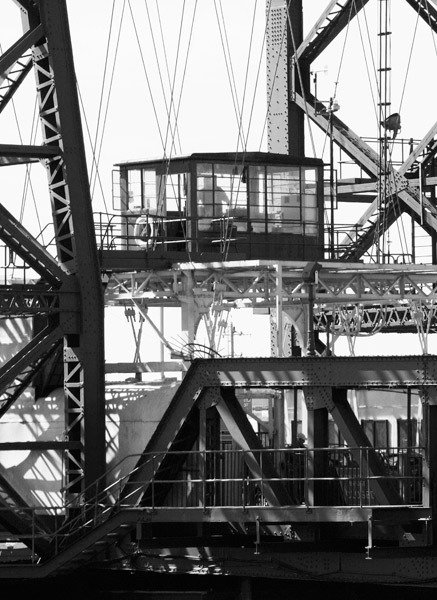 There are more specialist websites providing overviews of its history and engineering. 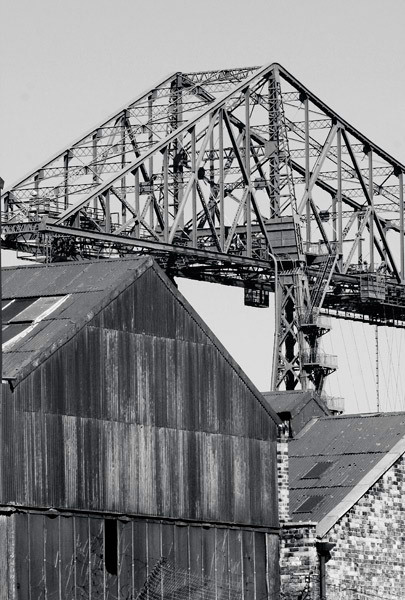 In 2007 I travelled by train to Middlesbrough to make photographs of what I might find remaining from earlier industry in the Middlehaven area between the town centre and the River Tees. My interest in photography had emerged rather too late as much of what I might once have explored had gone. That day I made a study of the Transporter Bridge that stood resplendent in new yellow-accented light blue paint of a major overhaul. 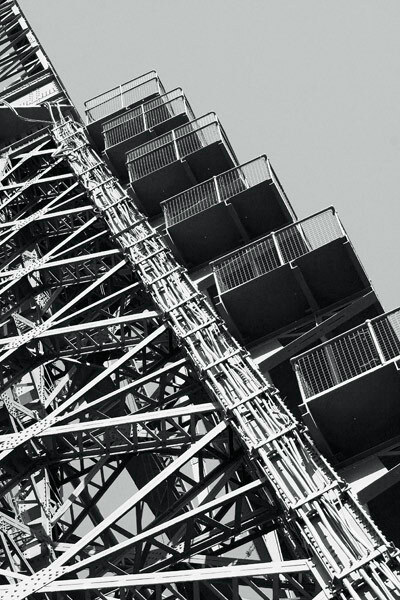 Three of those colour photographs are posted in the STRUCTURES gallery as contrast to this black and white set. I also photographed amongst deserted and decaying buildings often frustratingly set behind gates, fences and security guards. Some of those images are included in the CORRUGATED IRON gallery. They were insufficient in number and my good intentions to return have been sparsely realised. On my latest visit early in November 2011 the same area's street grid enclosed cleared sites punctuated by an occasional building even more dilapidated than before. Middlesbrough Football Club's Riverside Stadium, the new Middlesbrough College and Anish Kapoor's 'Temenos' sculpture of 2010 stand exposed (see the last in the STRUCTURES 1 gallery). 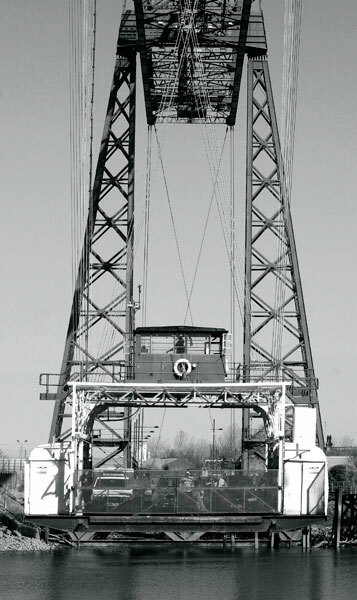 In 2011 The Bridge's centenary year was celebrated in a programme of exhibitions and events. At the Dorman Museum an exhibition set work by local artists and photographers of all ages alongside archive photographs of its earlier years. The Dorman and the Python Gallery also presented 'Hinterland', a collection of photographs by Middlesbrough born Stephen Gill commissioned in celebration. 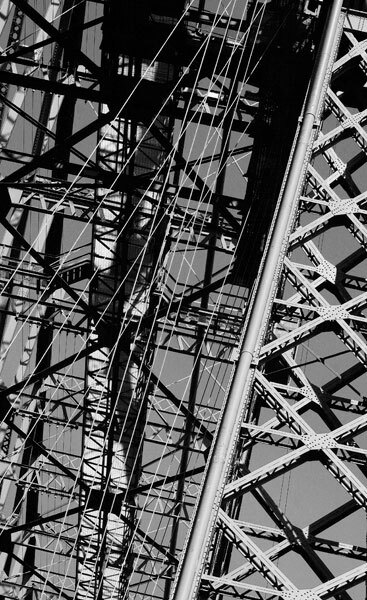 Using film, he photographed over winter months to create fine black and white images that explored the Bridge set within its riverside environment. The prints were created using traditional darkroom materials and techniques. 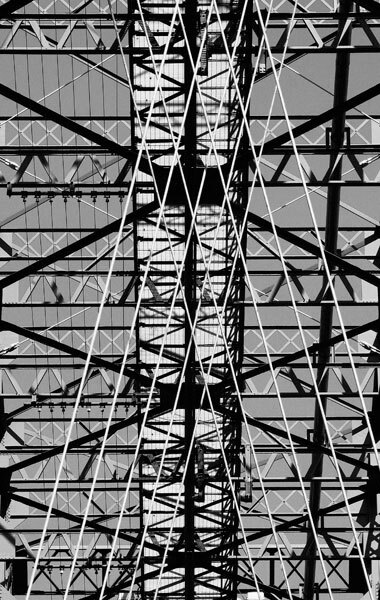 By contrast I worked digitally to record forms, shapes and patterns contained within the structure. 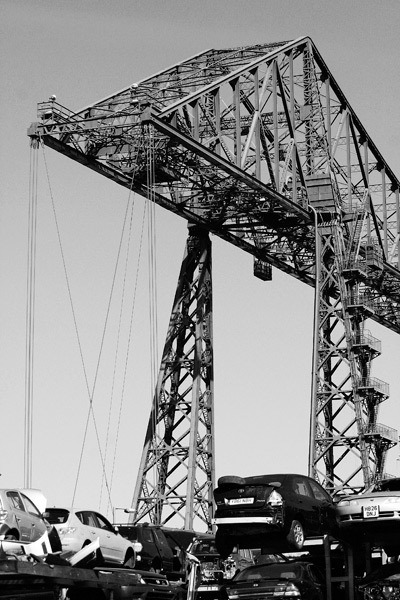 On the final mile into Middlesbrough the train passed close by the upriver Newport Bridge. Walking out from the town centre to the Dorman Museum I saw it looming over the distant end of a long street flanked by terrace houses. Later, I headed that way with the thought that I might afterwards be able to continue to the Transporter Bridge along riverside pathways. 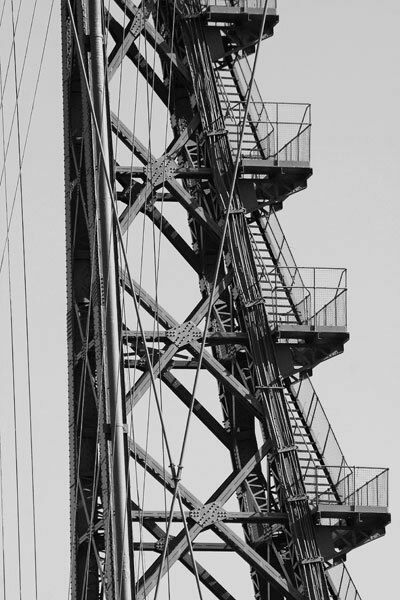 Completed in 1934, the Bridge's two 182ft towers carried hoists that once raised the 270ft central span 120ft above the shipping channel: it's now locked down as a fixed deck. Under grey skies and intermittent rain I photographed around the massive steelwork as well as the piers and timberwork at river level. 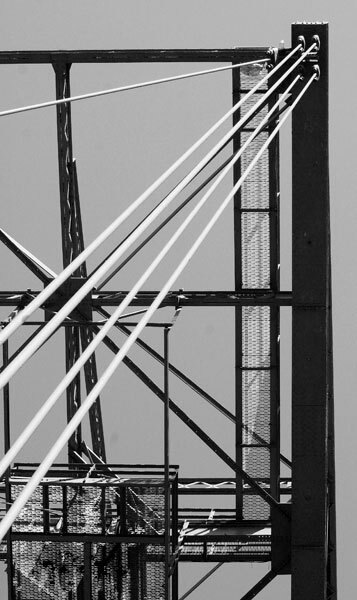 Three of those images are in the STRUCTURES 3 gallery. Time was short as I walked the downstream footpath. Some remnants of wooden wharves hinted at the shipping activity there must once have been when heavy industry dominated the landscape. At one point a few mounds, some stonework and an information board marked the site of a large ironworks now occupied by the neat and anonymous brick buildings of a 'trading estate'. The path ended at the boundary fence of an engineering works fronting the river. 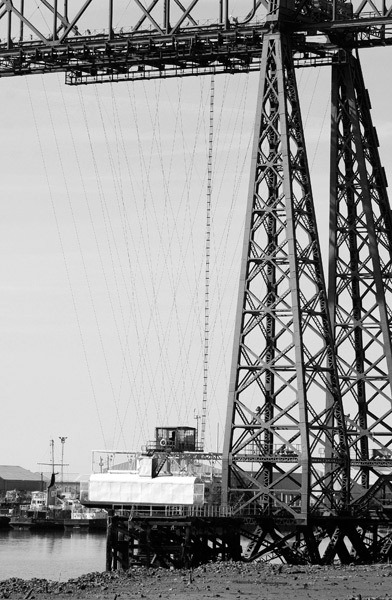 A street detour took me through an industrial strip down to the Transporter Bridge. Half a dozen houses in a terrace stood isolated and a dog from one of them sniffed 'hello'. Some small ships were moored at the quays. Across the river two large buildings sheltering the construction of rigs and equipment for the North Sea oil and gas fields dominated the view. Over its final miles to the sea the River Tees flows through a flat landscape between banks reaching very few metres above the high tide mark. In the nineteenth century the rapid growth of steelmaking, shipbuilding and other industries created a large population growth in the area. Middlesbrough at its heart faces Port Clarence across the river. Stockton developed further upstream and was the eastern terminus to the 1825 Stockton & Darlington Railway built to the designs of George Stephenson. Built primarily to carry freight it also established the world's first passenger carrying service. It operated developments from the steam locomotives he pioneered at Wylam Colliery in the coalfields of north-east England. The discovery of iron ore in the nearby Cleveland Hills was first exploited by the 1837 Grosmont Ironworks near Whitby; Middlesbrough's first followed shortly after. Large deposits of high quality ore helped establish the town as a dominant centre for innovatory iron working. The first commercial scale production of steel came in 1875 when around one hundred iron smelting blast furnaces were already in operation. River crossing by rowing boat at the beginning of the nineteenth century graduated to steam ferries carrying hundreds of passengers by its end. 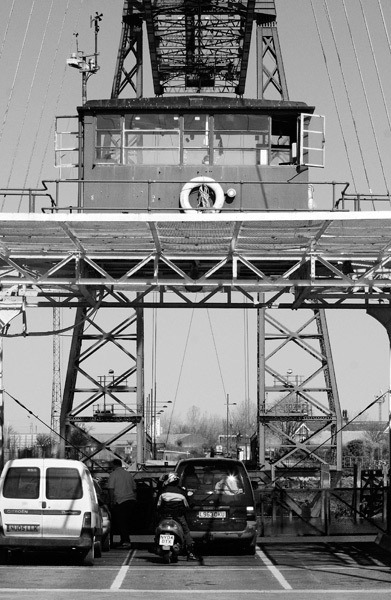 A bridge crossing to Port Clarence that did not hinder shipping became a priority. 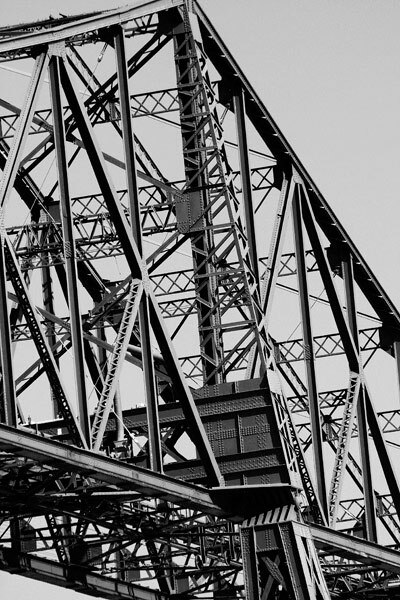 In somewhat similar circumstances the engineer William Armstrong designed the 1876 Swing Bridge in Newcastle. 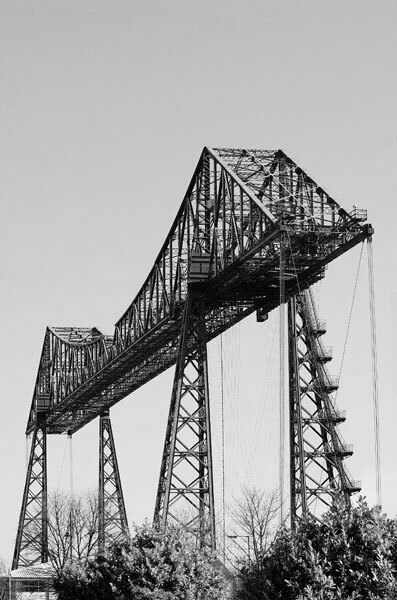 Its main 285 feet span centrally rotated under hydraulic power to open two channels that allowed increasingly large ships to navigate from his upriver Elswick shipyards through the city to the North Sea. It's still fully operational but the decline in river traffic requires only sporadic action. However, Middlesbrough adopted a different solution. In 1893 and in a similarly flat landscape the Spanish engineer Alberto Palacio completed the Vizcaya Bridge in Portugalete. 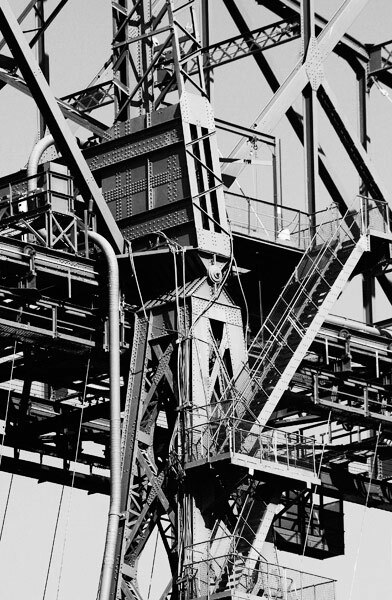 Charles Smith, a Hartlepool engineer, has been credited with the original concept of a suspended moving platform. 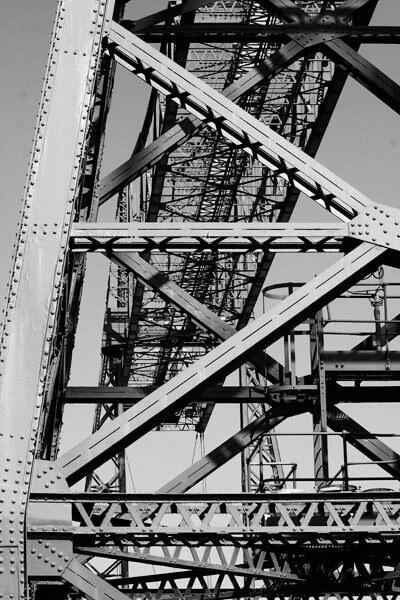 Constructed by the Cleveland Bridge & Engineering Company and the Sir William Arrol & Company of Glasgow, the Middlesbrough structure opened on October 17th 1911. 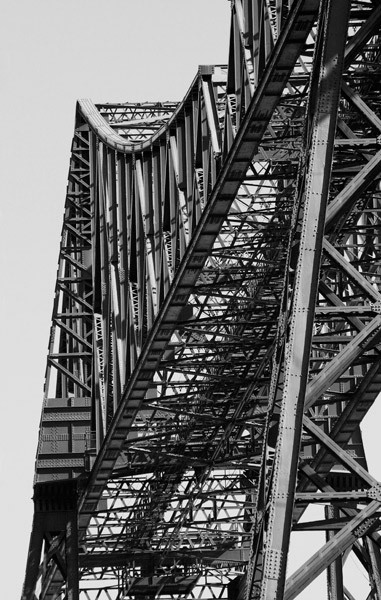 Two 225 feet high towers are some 570 feet apart and joined at their tops by a double cantilever span. Suspended from it by cables the deck travels across the river carrying some six cars and up to two hundred people. Worldwide, around twenty similar bridges were built between 1893 and 1916 of which eleven survive although some are inoperable. Middlesbrough's was one of the last built and is now the largest in everyday use. With the growth of motorised traffic the design's fixed capacity became an increasing liability and the principle became obsolete. It can take some time to wait for the gondola to arrive for boarding and making the safety gates secure before the fascinating ninety-second toll crossing can start. 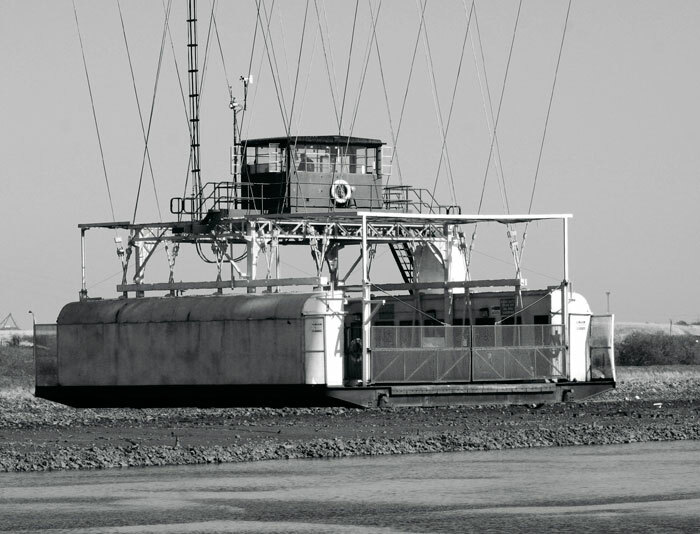 It's an aerial ferryboat that has shuttled its crew and passengers over the Tees for one hundred years and seems set to continue for many more.